Iranian President Mahmoud Ahmadinejad has dismissed as a US forgery a document allegedly showing plans by Tehran to test a nuclear bomb trigger. In a US TV interview Mr Ahmadinejad said the report in the Times newspaper was "fundamentally not true". He said criticism of Iran's nuclear programme had become "a repetitive and tasteless joke". 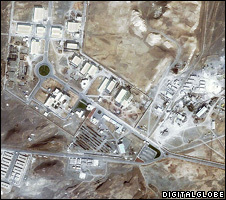 Iran denies claims it wants to build atomic weapons, saying its nuclear programme is for civilian purposes. The BBC's Jane O'Brien in Washington says the interview offered a rare opportunity to see an Iranian leader being questioned by the US media. But Mr Ahmadinejad's answers gave little indication that his administration is moving towards a more conciliatory position, says our correspondent. The Times reported last week that it had obtained a document, dating from 2007, describing a four-year plan by Iran to test a nuclear trigger using uranium deuteride. The product can be used as a neutron initiator: the component of a nuclear bomb that triggers an explosion. The memo apparently details how some work on the trigger should be outsourced to universities, but other work is too secret and must be carried out by "trustworthy personnel" within the organisation allegedly carrying out Iran's secret nuclear weapons research. Another document seen by the Times is said to be a memo from Mohsen Fakhrizadeh, naming him as the chairman of the Field for the Expansion of Deployment of Advance Technology (Fedat) - which the newspaper says is a cover for a secret nuclear weapons programme. In his first public response to the report, Mr Ahmadinejad said the accusations were "fundamentally not true". In an interview filmed on Friday with ABC News, but broadcast on Monday, he dismissed the documents, saying: "They are all a fabricated bunch of papers continuously being forged and disseminated by the American government." 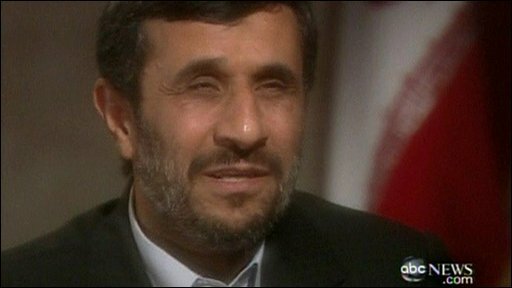 When asked if there would "be no nuclear weapon in Iran, ever", Mr Ahmadinejad said his view was already known. "You should say something only once. We have said once that we don't want a nuclear bomb. We don't accept it." A senior adviser to US President Barack Obama, David Axelrod, said it was "nonsense" that the US had fabricated the documents. "Nobody has any illusions about what the intent of the Iranian government is," he told ABC. Iran is already subject to three sets of UN sanctions for its refusal to suspend its uranium enrichment programme. It is at risk of further sanctions after it rejected a deal to send low-enriched uranium abroad to be refined into fuel for a research reactor. A defiant Mr Ahmadinejad said Iran would welcome talks "under fair conditions". "We don't welcome confrontation, but we don't surrender to bullying either," he said. "If you are saying you are going to impose sanctions, then go and do it." Mr Ahmadinejad also rejected criticism of Iran's human rights situation and allegations of mass arrests following the elections which returned him to office in June. "These things have to do with the judiciary. We have good laws. There is the judge. These people have got lawyers. These are not political questions." He said people in Iran had more freedom than in the US. The ABC interview took place before the latest protests held at the funeral of the influential dissident cleric, Grand Ayatollah Montazeri. Iran says its uranium enrichment programme is for purely peaceful purposes, aimed at generating electricity so that it can export more gas and oil. But the US and its allies say it could be used to develop weapons.